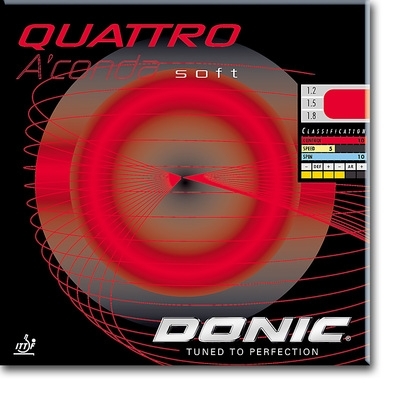 The DONIC QUATTRO A'CONDA with FAKTIS-Technology. Instead of synthetic rubber, DONIC have used the softening process with a natural rubber. This is slower but affords maximum grip. The extra softness ensures that the ball enjoys a larger "sweet spot" when making contact with the rubber. The result is more backspin, longer contact and optimum ball control. Recommended for defensive players who like to play with backspin.